We've arrived at the upper half of our top-ten list. Today we're thrilled to honor two wonderfully creative games that successfully explore the relationship between player and game. Even better: they couldn't be any more different. Enjoy, and please stay tuned all week for the rest of our top games of 2013! Media Molecule’s Tearaway is a videogame. This is a seemingly obvious statement, but so many other games, including several on this list, are almost ashamed by that. Their stories, their experiences, could be delivered in other media such as film, television, etc. and lose almost nothing in the translation. However, Tearaway is and could only ever hope to be a videogame. The PlayStation Vita has never been a poor investment but Tearaway is the first game that truly feels like a Vita title. The game treats the hardware as a precious resource: every feature is utilized, nothing wasted. In doing so the game creates a sense of engagement with the player most videogames, especially single-player games, are incapable of delivering. The front-facing camera captures and displays the player’s face in the sun, a benevolent deity (the “You”) helping the protagonist in their journey; the back touchpad allows the You’s fingers to assist in simple traversal and combat; the front-touch, back camera and microphone allow the You to bestow some influence upon the world by cutting designs, choosing patterns and recording sounds for the other entities in this world. There are no moral choices to be made and no characterization given to anything, but with so much interaction throughout the story it feels deeply personalized. Even without any lasting consequences the game crafts a more personalized experience than any other game could. The attention to detail is what sells it and if the aesthetics ever rang false the whole experience could fall apart. Tearaway’s visual hook is papercraft. Everything in the world is made from paper: the protagonist, the enemies, the flora and fauna, the rocks and water; even the ripples in the water as the player runs through puddles and streams are made from paper. Though the game runs at thirty frames per second (like most video games,) the framerate of the environment is less than half of that in order to convey the look of stop-motion animation, making a thoroughly unreal world look remarkably real. Other details all exist to emphasize the visual themes. The sounds are familiar: the rustling, crinkling and ripping of paper as the world changes. Even the ways main character controls and interacts with the world is as though it’s made of paper: legs are folded so the player can jump; when it rolls into a ball, Metroid-style, it is crinkled into a paper ball like trash and flattens out after; if the main character falls off the landscape or is defeated by enemies they’re then mailed back to the player. These details make Tearaway unique, engrossing and utterly charming. Tearaway does not have an especially deep story to tell, nor does it deliver remarkable gameplay; the game is actually quite easy and simplistic. And yet, Tearaway is a game that demands to be played because, more than anything, Tearaway is just fun. Nothing on this list will put a smile on the face of the You like Tearaway can. This is an article about the story of a man named Stanley. The writer of the article — an editor for a gaming website named after a mythical ape-like creature supposedly native to the Pacific Northwest — was weary, very weary indeed. 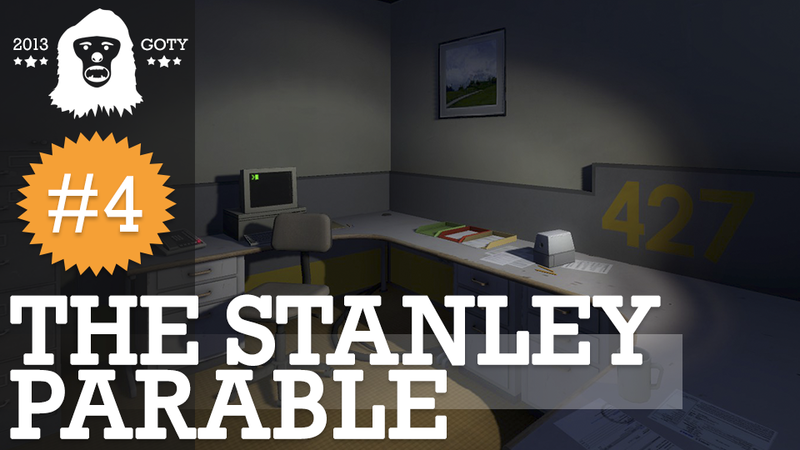 For you see, this writer had tried to impress upon his colleagues the uniqueness and importance the story of a man named Stanley — or as it was known in his world, The Stanley Parable. “It would be impossible to make in any other medium!” the writer had implored earlier, into deaf ears. “The Stanley Parable is at once a celebration and critique of games, meant for players and developers alike!” None of his fellow editors seemed to agree or even care; indeed, the writer of the article about The Stanley Parable had made many of the same arguments about it some two years prior. Ultimately, he only managed to get the game to number 4 on their site's list of the ten greatest games that year. The Stanley Parable’s major strength, thought the writer, was the way it weaved its narrative with an acrobatic dexterity. The player’s decisions could lead Stanley to several outcomes. Some were tragic, others heroic, some others miserable, and most of them fantastically hilarious. Each such thread, spun masterfully by Galactic Cafe, was expertly narrated by the amazing voice of Kevan Brighting. The writer could only hope to describe The Stanley Parable as “insanely brilliant” and hope that this ragged description was enough to make his readers at least a little curious. The Stanley Parable would probably be on sale soon; maybe then his readers could give it (or its excellent demo) a fair shake. The writer of the article about the story of a man named Stanley poured himself a drink and gave a heavy sigh. Fourth place. It was such a shame, such a terrible shame. Fourth wasn't bad, not really, but his last favorite game had reached third place -- clearly, he was slipping. Perhaps next year, the writer thought, he might, in a burst of brilliance, craft the finest arguments he had ever conceived. Perhaps then he would finally be able to convince his colleagues, make them see the light about his selection. Perhaps, for once, he would finally place his favored game atop their site’s list of the year’s greatest games.